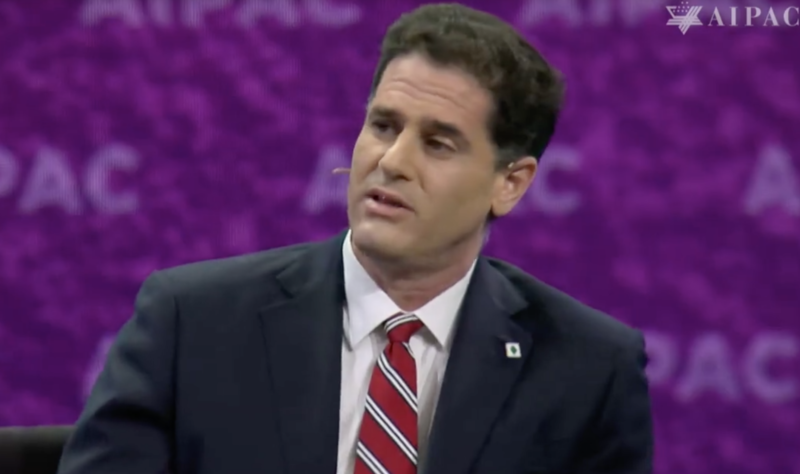 “There are leaders who are calling to return to that deal,” Dermer told a crowd of 18,000 at AIPAC’s annual confab. “That is something that has to be seen as totally unacceptable,” he said, without specifically mentioning the Democrats. His comments come a week after several leading Democratic presidential candidates made clear that they would reverse President Donald Trump’s decision to pull out of the landmark pact. The American Israel Public Affairs Committee’s 2019 Policy Conference kicked off Sunday. This year’s motto — “Connected for Good — is a rebuke to the controversy that has ensnared the organization over the last month, after freshman Congresswoman Ilhan Omar accused the lobby of paying politicians to support Israel. The confab is designed to emphasize that both sides of the aisle continue to support Israel, perhaps mitigating the perception that Israel has become a Republican cause. “The conference will focus on further strengthening bipartisan support for the US-Israel relationship,” an AIPAC official told The Times of Israel. During Sunday evening’s plenary session, i24 News’s Michelle Makori asked the Israeli envoy whether the Trump administration’s withdrawing the US out of the agreement and restoring sanctions was “enough” to ensure Tehran does not acquire a nuclear weapon. During the Obama’s administration, Dermer was one of the accord’s most vociferous opponents. He famously orchestrated Prime Minister Benjamin Netanyahu’s backdoor invitation to address Congress lambasting the deal, a moment that is widely regarded as stoking a partisan divide on Israel in Washington. On Sunday, Dermer, a former Republican operative, called the Israeli premier’s speech the “proudest day that I’ve had as ambassador to Israel to the United States.” He also said that urging America’s return to the Iran deal was tantamount to seeking to aid a country bent on destroying Israel. “Anyone who is saying that they’re going to return to the deal is basically saying they’re going to give hundreds of billions of dollars to people who are committed to Israel’s destruction, and our Arab neighbors’ destruction, and giving them a clear path to nuclear weapons,” he told Makori. Trump removed the United States from the Joint Comprehensive Plan of Action, or JCPOA, as the deal is formally known, and renewed sanctions against the Islamic Republic. Last week, Al Monitor solicited Democratic candidates as to whether they would rejoin the deal that Trump pulled out of. Five said they would, including Vermont Senator Bernie Sanders, Massachusetts Senator Elizabeth Warren and California Senator Kamala Harris. The Democratic National Committee also passed a resolution in February calling for the United States to re-enter the agreement. At the outset of Sunday’s question-and-answer session, Dermer applauded Trump for recognizing Israeli sovereignty over the Golan Heights, which he is expected to make official in a signed declaration on Monday at the White House alongside Netanyahu. “I think that deserves a standing ovation,” he told the crowd. Dermer was also asked if he thought there was still bipartisan support for Israel. “Yes, I think we have bipartisan support,” he said, and then began explaining why it was right to support Israel. This entry was posted on March 25, 2019 at 1:47 PM and is filed under Uncategorized. You can subscribe via RSS 2.0 feed to this post's comments. You can skip to the end and leave a response. Pinging is currently not allowed.